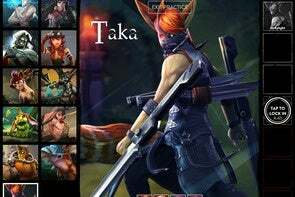 With free-to-play PC games like League of Legends and Dota 2 pulling in tens of millions of daily players, it was inevitable that such multiplayer online battle arena (MOBA) games would scale down for mobile. 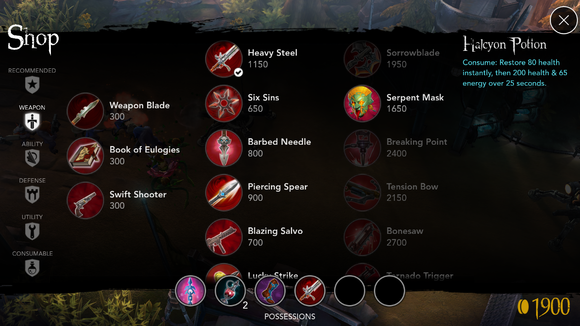 Strong options like Fates Forever and Heroes of Order and Chaos have shown that it’s possible to do the team-based tactical action genre justice on iPhone and iPad alike, but newcomer Vainglory might be the most impressive option to date. Does the name ring a bell? 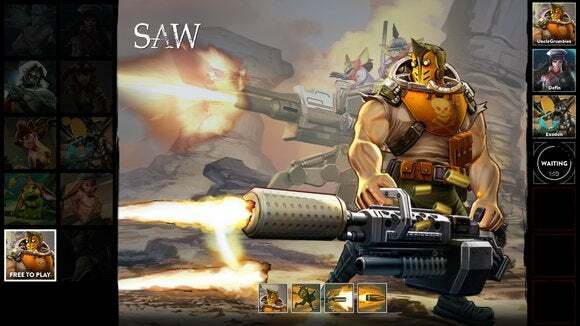 That’s because Apple chose Vainglory to spotlight the strength of the iPhone 6—and iOS 8’s Metal graphics tech—at September’s big event, and it’s been one of the most anticipated mobile games on the horizon since. Vainglory is finally out in the U.S. after rolling out to several other countries in recent weeks, and after playing the past few days, I’m happy to say that it really does live up to the immense hype and expectations cast upon it by Apple’s smart showcase move. Battles typically converge right in the center of the lane at first, and then momentum starts to swing in favor of one team or the other as you seek to destroy opposing turrets and get into the enemy base. If there’s any iOS game that deserves to be conceited, it’s the staggeringly well-presented Vainglory, which impresses with some of the best visuals seen on the App Store. The colorful and lushly detailed environment is the biggest treat, but even the fantasy characters are well animated, and the game runs super smoothly on the iPhone 6. It’s only compatible with the iPhone 5S and above on the phone side of things, while the separate iPad app digs further back with support for the iPad 2 and newer. 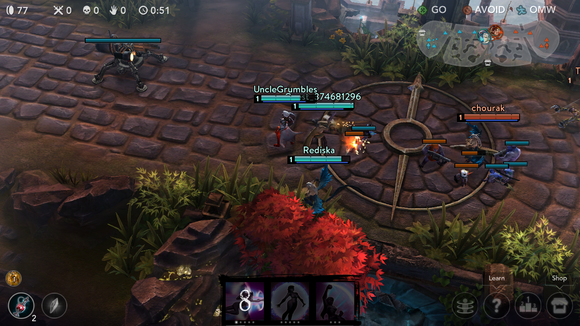 Luckily, this isn’t a case of beauty trumping all other aspects of the experience, as Vainglory delivers a strong mobile take on the full-fledged MOBA design. It spotlights three-on-three team-based action with fellow online players, and each squad must try to destroy the crystal at the opponents’ base. If the opposing team manages to summon a massive Kraken beast later in a match, good luck—it’ll bash through turrets with ease, and quickly end a match if you’re already teetering on the edge. But it’s not just a matter of overpowering your foes in head-to-head battle. Instead, you must work together to take down enemy turrets and use your own minion creatures as living shields to slowly push the conflict closer and closer to the other end of the map—and away from your own turrets and crystal. Doing so is less about constantly going on the offensive, and more about making smart decisions in every phase of the game. That means taking control of strategic points on the map, using earned gold to purchase smart in-match upgrades, and activating your limited-use special abilities at the right moment to maximize their impact. If you’ve never played a MOBA, it might sound a bit dull in spots: attacking automated turrets, taking control of resource mines, and spending a lot of time in menus doesn’t seem like the most thrilling concoction. In actuality, it’s a lot of fun, not to mention supremely satisfying when your squad works in unison to push the lane, dominate your foes, and crush the opposing crystal. After all, many millions of genre fans on PC can’t be wrong—right? Unlike a mobile MOBA like Solstice Arena that focuses on breezy battles, Vainglory matches typically last 20 to 30 minutes. As such, this probably isn’t the game for your commute or quick break, but rather a half-hour sunk into the lump in your couch cushion. That’s a gamble for an iPhone game, but developer Super Evil Megacorp even says that the iPad is the ideal play device for the game, and the match start screens make no illusions about the average skirmish length. It’s not exactly a quick-hit pick. Minions are the little creatures flooding the screen here—they’re easy prey that’ll help boost your player level, plus your own minions will soak up turret gunfire so you can get in close for attacks. 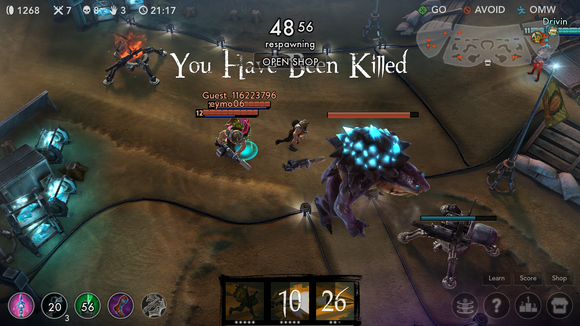 Otherwise, Vainglory adapts the MOBA formula to portable touch devices with large success. The touch controls—taps are used for movement, while attacks are automated and specials come with hitting an icon—are very responsive and easily understandable, although the lack of voice chat does make it tricky to coordinate actions with teammates. A simple system of preset text commands (like “go” or “on my way”) is available, but none of my teammates seemed to know or care about them. Or I simply didn’t notice them in the heat of the battle. The free-to-play design thankfully puts no limits on gameplay: you can play as much as you want, all day and all night, but only with the certain free characters offered at any given time. If you want to use a non-free warrior, you’ll have to pay a one-time fee with in-game currency—which accrues at a reasonable rate, but you can buy it if you need to have your favorite character unlocked ASAP. And since you can’t spend real money to access character perks or in-match bonuses, it never feels like a pay-to-win game. In fact, it’s a remarkably friendly freemium release. Buying in-match upgrades with earned gold is as important as fighting, since smart purchases will help you hit harder, take more punishment, and better utilize your special abilities. Having only one map with a single attack lane limits strategies and variety a bit, but despite some streamlining for the platform and market, Vainglory has the heart of a full-bodied MOBA experience—which is probably the highest compliment I can offer based on what I’ve played so far. And like the top PC genre entries, it’s a remarkably fair and fun free game that doesn’t penalize players who opt not to shell out. That makes it one of the best recent free options on the App Store, and a strong pick for both genre newcomers and veterans from other platforms. 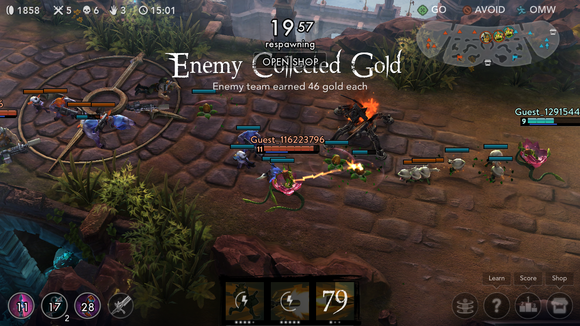 Vainglory is available now in the App Store, with separate downloads for the iPhone and iPad.